I admit that I’d made a mental note of the Ninos Hotel when I first started researching somewhere to stay in Cusco months ago. 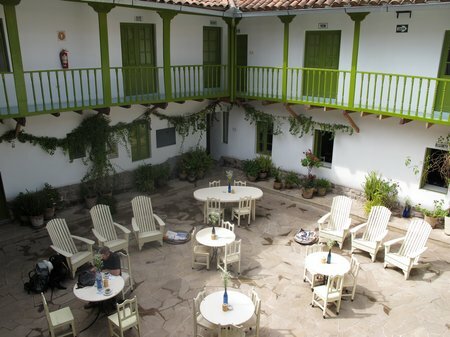 Of course I’d also noticed that at $25 per-person-per-night, it was over our budget (we try to stick to $12-$15) but the story of this hotel, founded by a Dutch woman with a passion for helping educate street children in Cusco struck a chord with me. Trying not to tip my hand, I passed the guidebook to my husband with a scant “I like the sound of this one”. He read the summary of the hotel and handed the book back to me saying “Let’s go see what it’s like and then we can decide”. We trudged up the cobblestones away from Plaza de Armas. It seemed as if we were also walking away from a cleaned-up, tourist-centric world and into a part of Cusco where people live and work. The streets around us were becoming grittier with every step. We walked into the courtyard at the Ninos Hotel and were almost knocked over by a train of six to ten year-olds swinging schoolbags and chattering at the tops of their voices. The sight of my boys with their backpacks almost silenced the chatter as these kids stared BigB and CAM up and down – only to be stared back at in return. 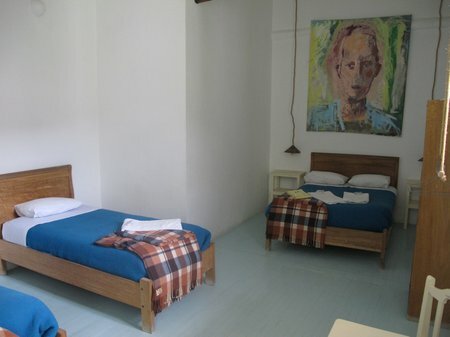 We were quoted a rate of $22 per person per night for a spacious shared room with a private bathroom. Both the room and the bathroom were gleaming. I was sold. We’d had three long overnight bus rides in the past four days as we’d made our way down Peru from the Ecuadorean border through Lima and Nazca to Cusco. I was ready for a little luxury. Then the person at the front desk suggested that for an extra $3 each our boys could take a smaller room on their own. The kids’ excitement at having their own space for a few nights was the clincher. Hang the budget for a few days, we all needed a little luxury. As I said, the rooms at the Ninos Hotel are very spacious. They are simply furnished with just a small desk in addition to the beds. The bright green of the wood trim, doors and shutters is bright and cheerful compared to the simple white walls. The large, polished and age-darkened beams in the ceilings make you realize that this building was once a colonial mansion which has been beautifully and tastefully restored. I could wax lyrical about the bathrooms at the Ninos. That’s the thing about backpacker accommodations, the bathrooms are sometimes, actually frequently, the achilles heel of the property. 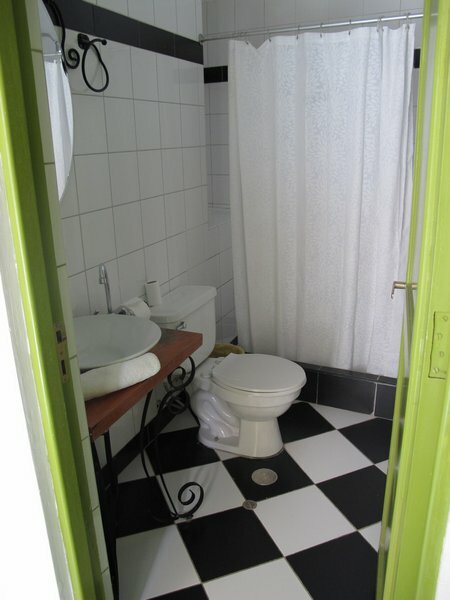 At the Ninos Hotel, the bathrooms are cleaned daily and there is constant hot water. There is a small cafe on site which serves breakfast and lunches – and has a small library of books (in a variety of languages) which you can borrow to read. We stayed at the Ninos Hotel (actually Ninos II) for four very relaxing days. The ambiance at the hotel is such that when our children wanted to hang our in the courtyard with a book or have some internet time in their room (wifi is free), we felt safe leaving them there while we went for a walk or a drink. There are many other good hotels in Cusco, but for good value and to support a great cause, I’m glad we stayed here. This entry was posted in International Escapades, Peru and tagged Cusco, Ninos Hotel, Ninos Hotel Cusco, Peru on November 6, 2010 by wandermom.